Complete this 'funding form' if applicable. Read the information below and get ready to join us! We are an early years registered setting for children ages 3-5, and also welcome homeschooled/flexischooled/unschooled older children. Run by qualified Forest School Leaders with Level 3 Early Years or teaching qualifications. Getting muddy, and having fun! 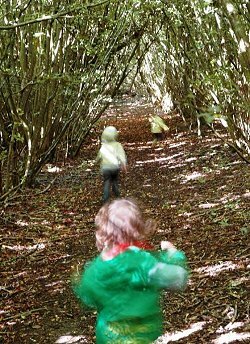 "Children are happy and enjoy their time at forest school. Safeguarding is effective.. Staff interact positively with children, encourage their creative play, and for children to explore and investigate. Children form secure emotional attachments and positive relationships." 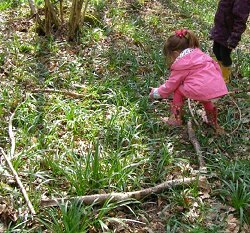 The aim of Forest Kindergarten is to create a stimulating and friendly environment where staff and volunteers assist with a child's development in the unique woodland environment at Ide Hill. Rucksack, with side pockets, and waterproof cover. Deuter/ jack wolfskin are excellent quality. Pack with: plastic bag containing lightweight change of clothes - socks, pants, trousers, longsleeved top, spare fleece and gloves, spare plastic bag; packed lunch, water bottle, tissues and wipes at sides. Cosy trousers i.e tracksuit pants, fleece leggings (NOT jeans). Two pairs of mittens (age2-3s), gloves age 4+. One size fits all 'magic gloves' work well. (One waterproof pair if preferred). If you feel your child needs insect repellent please apply in advance. Waterproof trousers and jacket: Waterproof trousers, or dungarees. It is important that even in dry weather your child still has their waterproofs as this enables them to play in puddles, mud and sit on damp ground etc. They also protect from scratches and prickles! - Warm Wellies (waterproof thermal boots). - Decathlon - stocks a large range of good value children's outdoors and waterproof gear. Collection & Drop off. Park in the woodland car park and meet us in the woodland next to it between 9am-930am on kindergarten days, or at the start time for holiday/tots sessions. The site The kindergarten has a licence with the Birchfield Farm to use an area of woodland we call 'Base Camp', 5 minutes walk from the carpark. It has been risk assessed by tree surgeons and ourselves, and is monitored on a regular basis for tree safety in particular. We have a composting toilet (hole in the ground), and handwashing facilities, and also use the large tarpaulin shelter. We also have small fires by our log circle, where we may have hot drinks on cooler days. We also love to explore the further woodland, which we have also risk-assessed, and provides a great deal of variety. Daily Routine During each session we shall usually begin by meeting at the log circle for songs and circle time. Then we will spend most of our time playing and exploring the woods. Staff will also model activities for children to join in with at their will. We will take shelter under the parachute if needed, and we have a selection of books, and hammocks for children to rest in. Staff will also model activities for children to join in with at their will. We will take shelter under the tarp if needed, and we have a selection of books, and hammocks for children to rest in. Books available and comfortable places to nap in the hammocks. Circle time, and daily reflection time. Snack time We provide a midmorning snack each session, where children can choose from either fruit, or oatcakes. We also sometimes cook on the fire, or have a hot drink. Provide children, staff and parents closeness and freedom with nature, deepening the exploration and connection with self and the environment. Create a positive ethos that is reflected in all interactions with one another and the environment, supporting and cultivating respect for the world and others, through mindfulness and compassion. are carefully selected, screened, trained and supervised and will be kept up to date with Child Safeguarding training. develop positive behaviour management skills in order that the children feel safe, secure and know that they can rely on being cared for in a fair, non-judgmental way, where feelings expressed are acknowledged and taken seriously. encourage children to express their ideas and views on a wide range of issues. Policies - see here We also operate an "open door" policy, where the staff are always willing to discuss your child's progress or concerns in confidence. 15 hours of government funded (subsidised) places are available for all children, and can be shared with a second setting. To register, please complete the funding form on application. This funding provides just £4/hr/child. As it costs us £6/hr to run, we therefore also send an optional termly fee to cover this difference, and to ensure we can pay a 'living wage'. An invoice for additional hours will be sent at the beginning of the term, of £6 per hour. Notice period- please give one half-term's notice in writing if your child will be leaving the setting. Owner/Manager Caroline Watts, NVQ Level3 childcare qualified, Forest School Practitioner OCN Level 3, Paediatric First Aid trained, SENCO & Safeguarding trained. Deputy Manager Serina Douglass, Forest School trained, qualified primary school teacher, paediatric first aid and designated safeguarding lead trained. Practitioners: Sophia Beck, montessori early years teacher trained, First Aid and basic safeguarding. Anna Hewlett, outdoor education & maths teacher trained, First Aid and basic safeguarding trained. Lynda Gilbert, previously ran her own nursery; has helped run forest school sessions since June 2013; basic safeguarding training 2013. Chinatsu Fisher; mother and assistant at forest kindergarten since 2016. Basic safeguarding training. All staff have cleared enhanced DBS checks. What do you do when it rains? Play!! Remaining warm and dry is the most important element to create happiness and creative play in all weathers. Whilst the woods themselves afford shelter we also have a parachute shelter over the log and fire circle, and have popup tents at our disposal to provide extra protection. We have a fire at snack time on cold days, and often will have a hot drink. What about toileting? 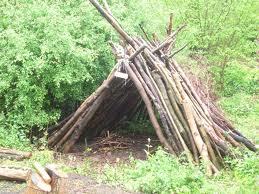 We have a specified area in the woods where we erect a tarp to offer shelter and privacy for toileting. We compost our waste - offering the children the opportunity to witness the transformational process of poo into roses! Children not used to toileting outside quickly adapt; staff are on hand to assist as needed. We provide handwipes or water, soap and towels for handwashing after toileting and before eating. How do you help children settle in? You are welcome to first visit to meet staff, ask questions and explore a bit of the woods with your child. Every child is individual; some children just wave goodbye and others find leaving their parent/carer difficult. We want to do what is best for your child, so when your child starts pre-school regularly, if you feel the need to stay, please do so. Community The kindergarten encourages positive relations with the local community. We have strong communication with Sundridge Primary school, whose Reception and Year 1 classes also have done Forest Schools with us for 3 years, and also invite reception class teachers to us to see children who will be moving on to their primary school. We also often host teachers and students who are interested in the forest kindergarten's practice. We have links with other local schools and the farm, where we visit the lambing in spring. We firmly believe the kindergarten should be an important part of the local area. We also offer professional training in storytelling, mindfulness, and nature connection. Outings With parents' permission we take children out and around our beautiful surroundings, and on occasional visits to the farmer, eg. During lambing season. Events Parents and grandparents are warmly welcome to our Easter, summer picnic and Christmas celebration. Insurance We are covered by Employers Liability and Public Liability Insurance, specifically for forest school activities, up to £10,000,000 (Compulsory Insurance) Act 1969. Registration with Ofsted We are registered for children from the age of 2 years. We have up to 18 children per session, with a minimum ratio of 1:8 children to qualified staff. Our ratios are usually however, 1 staff member to 5 children. Whilst your child is attending Forest Kindergarten, we have a duty to ensure that s/he is safe at all times. We aim to provide safety for the children that balances the benefit of risk taking, thereby enabling and supporting learning and discovery in the world and self. The outdoor environment is regularly checked to ensure that your child is playing in a safe but interesting environment. We have an ongoing relationship with the tree surgery company Tree Craft, who regularly manage the woodland to ensure the site is safe. Knowing the local woodland environment well we ensure that the children are safe from hazards. If you would like further information about Forest Kindergarten, please contact Caroline Watts (07718896919). Also see Forest School Association website.